NOTE: Considering Hurricane Matthew from last week, this post is an odd coincidence. It's been planned for a year and happens to come after the storm's devastation. Weather plays a factor in many disasters (tornadoes, hurricanes, blizzards, etc.) and in Hurricane Crimes, weather has a big role in the plot. Not only that, but it also contributes to the tone. 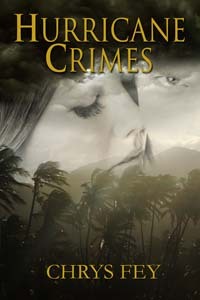 In Hurricane Crimes, Beth and Donovan are stuck in the middle of a category 5 hurricane. Category 5 hurricanes are the strongest hurricanes possible. They have winds that gust at 157 mph or higher. Is a category 6 possible? Scientists say no. There are several factors that limit how powerful a storm can become. 200 mph is the highest that hurricane winds can theoretically get, and category 5 storms are already rare. She took a deep breath to brace herself and wrenched the knob. The instant the door was cracked open a gust of wind shoved its way through, yanking the door out of her grasp and slamming it into the wall. She stumbled back when the wind collided into her chest, knocking free the breath she had sucked in seconds before. Her hands groped for the slick doorknob and she had to use all of her strength to wrestle the door closed. An invisible hand plastered her into the hard wood, grinding her spine into it. She pushed forward and pulled herself along the length of the concrete wall; she practically had to claw her way. When she stepped beyond the wall, wind slashed at her and rain hit her like liquid bullets. Her maple hair flipped over her face, wrapped around her neck, and whipped her cheeks. Walking down the driveway was a war between the steep decline and the gusts eager to see her face-plant into the cement. She reached the bottom without toppling head over feet, waded through the water flooded at the foot of the driveway, and began to make her way to the wrecked car. The sky above was a thick, whirling mass of gray clouds. It looked angry. Wet leaves and pine needles blanketed the road and water flooded the ditches, creating two rivers on either side of the black pavement. Pine trees were bending in every direction as the wind ordered, nearly snapping them in half. QUESTION: What forms of extreme weather have you experienced? Hurricanes and blizzards and dust storms and severe thunderstorms.... Glad you made it well through the storm. No trees on my house, but many neighbors not so lucky. I weathered the storm. ;) For me, I had a lot of branches down. Blizzards when I lived up north, hurricanes since I've lived in Florida. Had a few tornado watches/warnings, too, but thankfully never experienced any actual ones. I've been through tornado warnings and watches, but not an actual one either. I hope neither of us do. Hurricanes and blizzards are worthy of the Cat's hate. Good to know two hundred miles per hour is as bad as it could get. I think tornadoes top off around three hundred. I always want to live at the beach- until hurricane season. Then I'm happy to be nestled in my inland hills. Tornadoes can do extreme damage, but a hurricane spreads the damage so much further. Our town made the national news yesterday when the Neuse River crested. half the town is without power and now a large portion of it is underwater. Goodness! I am praying for everyone in your town. Only extreme weather I've dealt with has to do with snow. I'm fine with that too. Nice excerpt. Anything hurricane has a new appreciation from me. Not that we got hit, but just the threat is enough to throw life off completely. The threat of a hurricane can impact you greatly. Here in the UK we had a hurricane in the 80s. caused much havoc and tress being uprooted. I dopn't think we get them that often so I feel for any place who get their fair share of them. Hurricanes are not something to scoff at, for sure. Florida hadn't been hit in 11 years and this year we've been impacted quite a bit. Please excuse spelling mistakes but my lighting isn't very good at the memonet....needs a new bulb. Luckily, I live in a fairly safe (except for excessive heat) area. We can get some wild Micro-bursts during Monsoon and I've managed to be struck by lightning twice. Dust storms have become quite an issue in recent years. Great excerpt! I like the phrase "grinding her spine." That makes me feel it. Good showing instead of telling. The excerpt was really good. I'm certain you can relate to the wind esp ially since you just experienced the most recent hurricane. I have lived through a major blizzard ( blizzard of '77), driving through horrible fog where I could not see the end of my car and had to look down the side to see the yellow line to make sure I was on the right side of the road and a major windstorm which took my roof shingles and many trees were uprooted. Yes, I've been through quite a few hurricanes and tropical storms. I like fog but not fog as bad as that! It sounds like I'm similar in my experiences here...Hurricanes, Blizzards, and Ice Storms. Although I've also dealt with Sand Storms before too, so maybe that's new! A sand storm is a new one to me. I've never experienced one, and I don't think my characters will either. Let's just say they aren't particularly present. You're right about that, Hilary. Sounds like you've picked a good place to live. Hurricane Matthew was quite the force. So glad you're okay, Chrys! I have a friend in Jacksonville and we emailed the night before. They waited out the storm at home and lost power for a few days. They're all okay though. Beth and Donovan survived with some ingenuity;). I survived a tornado, a memorable experience. Weather can really contribute to the theme, atmosphere and directly to the plot of a story. The thought of a tornado frightens me more than a hurricane. Gosh, those anomalies are fierce. I was living in California with my grandmother in 1982 when a hurricane came though. I was just 12 years old and all I remember is a lot of wind and rain. A couple of the many tree's in my grandma's yard fell over and the fence blew over. A few years ago I was in an earthquake here in Las Vegas but I think it turned out to be a 5.1 so it wasn't too bad. Trees and fences are usual victims of hurricanes. A 5.0 quake could be considered a decent shake, depending on where you are. I thought about you when the hurricane came along and you marked yourself safe via Facebook. I thought, hope it's not as bad as the weather in her books! For me, it wasn't as bad, but other areas did get as bad. Or close to it. We live on a fairly large large in central BC. When the winds reach up to 100 km, I am nervous. I can handle pretty well any kind of weather, but not wind. I saw a wind tornado go through my neighbour's yard last week. Fascinating, but it was only 3' x 6'. Meant to add that I'm glad you're okay, Chrys. I would be freaked if I saw any tornado. Big or tiny. We don't really get "extreme" weather here (unless you count 105 degree temps in September), so I haven't really experienced any extreme weather. Gusty winds make me nervous, so I have no idea how I'd do in a hurricane (I assume not well). 105 degrees could be considered extreme. The thought of weather burying houses is frightening beyond breath. Great excerpt, Chrys! I guess the worst weather I've experienced is a blizzard. We've had many threats of flooding, and my basement has flooded, but it's nothing like you see on the news. Our city built a floodway that protects it, thankfully. But it's always scary to see the towns south of us completely covered by water. So glad you're okay! Living in Florida, do you get "used" to hurricanes, or are they still really scary? Do you find the media outside of the state exaggerates the situation? That certainly happens to us. Many Floridians get used to threat and usually don't bat an eyelash if a tropical storm or lower hurricane is approaching. We hadn't had a hurricane get so close to making landfall in 11 years. When a Cat 5 is said to make landfall, we do fear. I was worried about Matthew. I was right where the eye was supposed to make landfall but didn't, and nothing happened in this area. Nothing at all. Other areas got hit worse, which is a mystery.